Gaos – evil, even at the dinner table. Turtle Soup for the Soul. Once more for the next generation: Gamera Vs. Gaos! Moderno melodramo maximus! GAMERA: GUARDIAN OF THE UNIVERSE, despite a few shortcomings in the effects department, is everything a science fiction thriller should be. This 1995 reboot of the Gamera franchise is filled with suspense, wracked with tension, epic soundtrack and captivating action, and boasts some actual acting from all its principals. Like Toho company’s Godzilla franchise, Daiei Films’ Gamera franchise is classified in exactly the same Periods or Eras. The first goofy lot of Gamera films (from 1985’s GAMERA to 1980’s GAMERA: SUPER MONSTER) were Showa Period. This reboot is the first Heisei Period film. Gamera first defeated the bloodthirsty pointy-bird Gaos (or Gyaos) back in the third Showa film, 1967’s GAMERA VS. GAOS. However, like his cousin Godzilla started denying the existence of his Showa era, Gamera’s rebooters have also ignored their Showa era. As far as they’re concerned, GUARDIAN OF THE UNIVERSE is the discovery and origin of Gamera the giant flying turtle, and the first time he has met Gaos. This Heisei series – like Godzilla’s Heisei – propels Gamera in a darker direction that doesn’t involve Japanese boys in painful tight shorts screaming his name and waving. A young biologist (Shinobu Nakayama) tries to capture the pointy birds at the army’s request, enticing them into a stadium with sides of beef and intending to use the closing dome to thwart their escape. Meanwhile, something big is heading towards the dome and a studly Marine officer (Tsuyoshi Ihara – another Japanese lead who looks like Patrick Swayze!) tries to warn the biologist of it – to no avail. 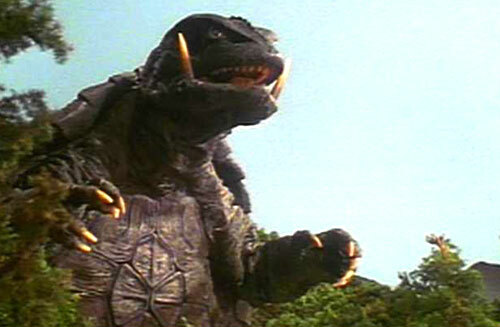 Gamera – he’s back to clean up Japan. And this terrarium. GUARDIAN places the whole pointless creature-fight into a mythical perspective, linking it to Earth’s past, with Earth’s future at stake. The creature designs are more impressive: Gaos is wrinkly and oily, wicked eyes and jagged head. And Gamera now flies like a Jet Jagaaa, only using his two hind feet, that looks way cooler than rotating like a silly top. The sincerity is so much more evident in this feature that it reminds us at times of JURASSIC PARK, JASON AND THE ARGONAUTS and the better Godz movies (GODZILLA AGAINST MECHAGODZILLA). Another major difference between GUARDIAN and other Gamera movies is that usually the Scientist, the Annoying Kid, the Soldier and Politician all work together against the monster threats – but this movie throws all that kumbaya out with the crusty rubber suits. The Scientist doesn’t want to work with the military, because naturally she’s a conservationist (“You know nothing about these creatures – and you want to capture them? !” Also, the fact she is a hot young heroine – I love the progressiveness of these newer daikaiju movies!). The army cannot summarily send out toy planes and toy tanks on a whim – as they do in all those other films – because the politicians want the order to go through congress and red tape! The politician on scene screeches impotently, “We’ve no authority to do that – even in cases as ridiculous as this!” So many new angles in this film. Even the fact that the English dubbing sits more in line with the actors’ emotions – we don’t realize how much it is missed until we see it done well. 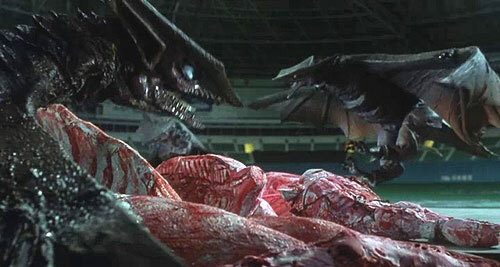 Story is built to an actual exciting climax where a giant Gaos battles Gamera in a massive city-flattening dustup. Gamera’s final resurrection in nuclear flames is like the Second Coming. Everything – from the direction, effects, editing and sound – is done so much better than usual that it raises the level of this B-movie to one pair of painful tight shorts away from being an A-minus. aka: GAMERA DAIKAIJÛ KUCHU KESSEN. Writers: Matt Greenfield, Kazunori Ito, James Shanks. Starring: Tsuyoshi Ihara, Akira Onodera, Shinobu Nakayama, Ayako Fujitani, Yukijirô Hotaru, Hatsunori Hasegawa, Hirotarô Honda. GAMERA: Naoaki Manabe, Jun Suzuki. Version: Japanese, with English dubbing.